By now, Flypower should not need anymore introduction. We have see Flypower being used by Kido/Setiawan in the recent Japan Open and then in Indonesian Open GPG, and also being used by many other players who belongs to the Djarum Club. 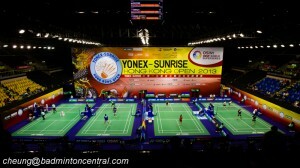 The popularity of the Flypower racket should’ve skyrocketed in Indonesia by now. After reviewing the Tornado 900, Kalderra 779 and the Warriors 7 last month, I got another 2 rackets from Flypower USA. 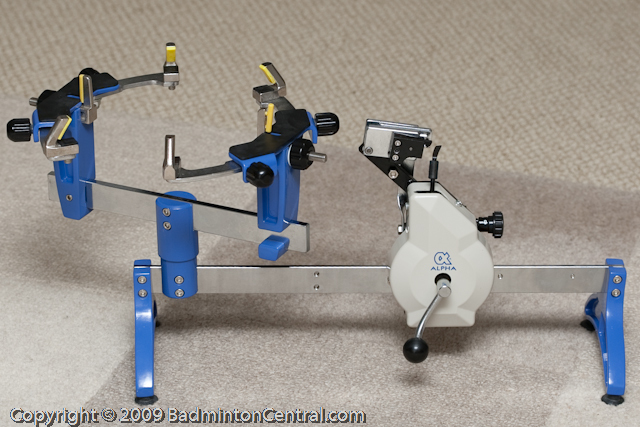 This time it is Markis fest because right now i am holding two racket that he uses, the Tornado 800, and the Enigma 900. It is strange though, as these two rackets have quite different characteristics, as we shall see. I will start off with the Enigma 900, Markis’ latest one. The Enigma is an absolutely beautiful racket. 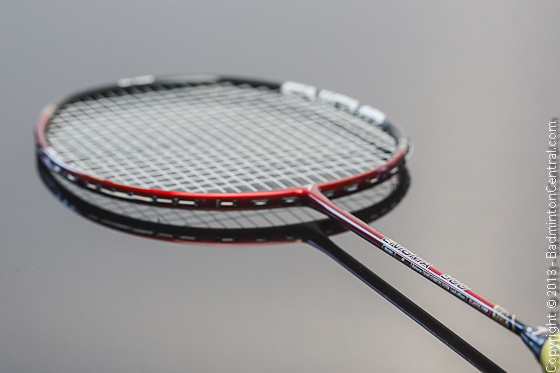 As we all know, all Flypower rackets are their original designs, the Enigma 900 is no exception. After having reviewed 5 Flypowers, i noticed that, aside from the Kaldera, there is a certain theme to their designs. The most noticable one is the color scheme. Dark/Burgundy red, black and white seems to be a recurring theme, employed in the Tornado, Warriors and now the Enigma ranges. The Enigma 900 has a dominant dark red color shaft that extends into the frame. An asymmetric design leads the red up to bottom part of the frame on one side and top half of the frame on the other side. I personally really like asymmetric designs, i think that brings uniqueness as well as a break from the orderly Yonexian symmetry. 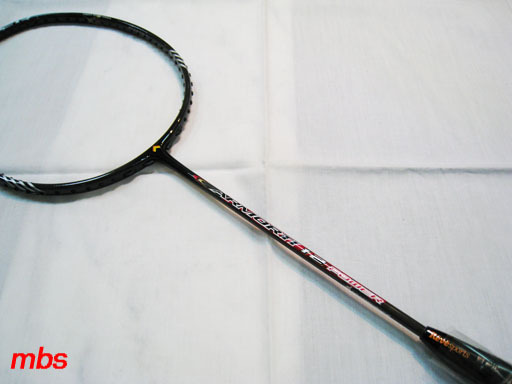 The remaining of the frame brings out what this racket is about, exposed woven carbon fiber which immediately indicates that this will be a racket with great feel and touch. Color transitions at various point of the racket as well as along one side of the racket shows another very unique Flypower design elements, batik pattern. While not being familiar with the different batik patterns, the one chosen by Flypower here is a mixture of black and light brown which contrasts very well with the rest of the racket. The whole design completes with ENIGMA in huge fonts at the inside of the frame. The result is a really stunning looking racket. My sample weighs in at 86.95 grams with a BP of 286mm from the handle base which makes it a moderately light balanced racket. The slightly tapered shaft measures 7.14mm on the handle end and 7.04mm near the T joint. The slim frame measures 10mm at the T and then gradually tapers to 9.59mm at 3/9 o’clock and 9.5mm at 12 o’clock. Aside from the slim frame, the profile is quite unique with a slight triangular profile that tapers towards the inner frame. This reminds me of the Victor Meteor profile but just not as pronounced. The triangular profile on the Enigma 900 is most distinct at the top of the frame and rounds off at the T joint. The stringing pattern is a pretty standard 76 holes non-shared hole pattern that very popular among all manufacturers. I laced it up with our standard test string Victor VS850 at 28lbs which is rather high for a slim frame. The frame held up really well with only slight deformation during main tensioning which is rather normal. i noticed the 11th main on the side is routed very close to the side of the frame. This is great design as it will minimize string breakage during mishit on the sides. For the cross, 21 cross strings does leave some gap at the top but that’s pretty normal as well. Grommet used on this model are of very high quality, single/double string grommet are used appropriately at various point of the frame to maximize feedback as well as frame strength. Double strings grommets are appropriately flared on the inner side as well to reduce grommet wear. On the hands, the Flypower Enigma 900 has a moderate swing weight, not very heavy nor too light. The swing speed is fast but not as fast as headlight rackets like the Warriors 7. The shaft is rather stiff but at the same time, lively. Dampening is well controlled and kept moderately so which is OK for feedback. Despite that i have not have much problem with touch shots. Frankly though, the stiffness of the Enigma 900 took me a while to get used to. My first day with it I almost wrote it off as too hard to use. It was conquering me. I handed it off to a different tester and he managed to understand the racket better than me. Only then did i realized that the racket really need to be played fast, but not hard. Most offensive racket once enough force is applied they will do their job. For the Engima smashing and other hard hitting must be done with with speed and the result is an explosive repulsion. Basically, what it means that is don’t try to force the racket into submission. Give it enough speed and it will do its job. Enigma? Being a medium heft racket the swing speed is rather fast. Couple that with the lively shaft means that drives are very easy to do. I more than once have used it to out drive my opponents. On top of that, the stiffer shaft really helps control and positioning with minimal deflection and repulsion. Stability is moderate but I don’t find much issue with it. Net and push shots are good with decent feedback coming from the racket. Impact is crisp and has a decisive feel to it. Clear and drops are very good as well. Being a stiffer racket slightly more effort is needed on the clears. Good feel is provided for drop shots from the back of the court and it was easy to adjust for slice timing as well. Overall I feel that the Flypower Enigma 900 is a slightly more demanding racket suitable for upper intermediate player. Some players will take slightly more time to adjust to the racket. However, once that is achieved, the fast swing speed and stiffness means that it is a excellent racket for offensive doubles, especially for players who likes to drive fast at the mid/front court and hit hard at the rear court.